Do you have problems with installing windows xp from cd blank?. 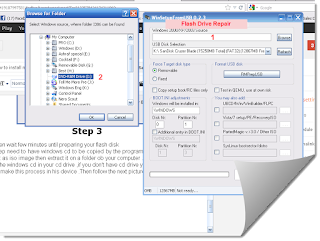 Do you haven't dvd writer or cd writer in your computer and need to install windows and you can't?.You are in the right article .We will explain how to install windows from usb flash .Now you don't need to buy external cd drive.Just need usb flash disk and follow the steps . Some laptop and computer doesn't have cd drive for installing windows ,so what is the solution .There is two ways ,the first choice is to buy external dvd drive and this choice is expensive .The second choice and don't waste your money is to installing windows from usb flash disk .It is just few steps and you will have multi boot windows usb flash drive and you can install any windows you want . Now you ask me a question how can we do this ? 3- WinSetupFromUSB program to make the boot. After you download the program install it on your computer .Open Win Setup From USB_0-2-3.exe Then see the next picture. 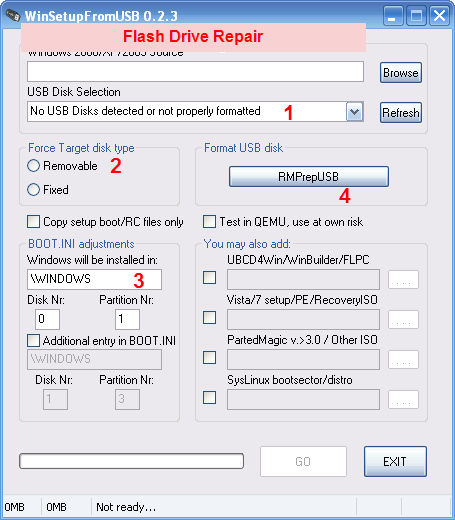 1- plug in your usb flash disk in your computer.then it will be detected by the program in the number 1 shown in the picture. 2- Mark on and choose Removable. 3- Must be like number 3 in the previous picture . 4- Press on RmprepUSB then follow the next picture . 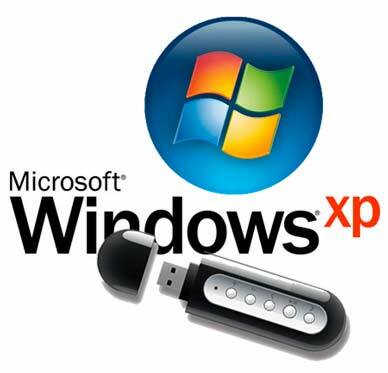 1- choose xp/Bartpe Bootable (NTLDR) . 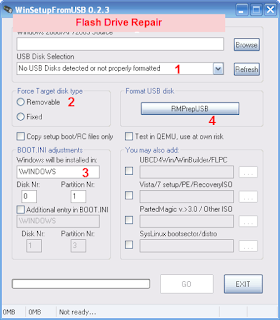 2- choose NTFS and from the right side near to it choose boot as HDD(C:2PTNS). 3-Press on prepare device . 1- press on Browse then choose the place of windows cd if it is in your cd drive or in a folder in your computer . After you doing that press on ok in the bottom of the main window of the program. you must wait may be 10 min or more depend on your computer ram speed. 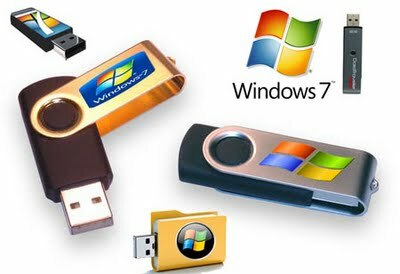 after it finish it will give you a window press on ok .Now i can say to you congratulation my friend now you have windows xp in your flash disk . only one thing missing to finish it i will give you boot files to replace it with the boot files in the flash disk .You will replace this files menu.lst and winsetup.lst. 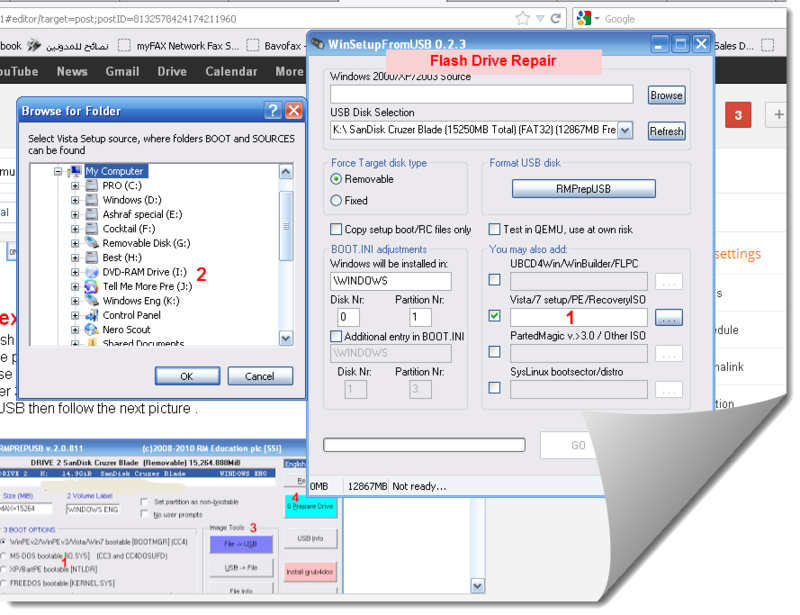 there is 14 servers to download from it ,choose your server as you wish .After downloading files extract it then copy the two files then put it in flash disk , and press replace. 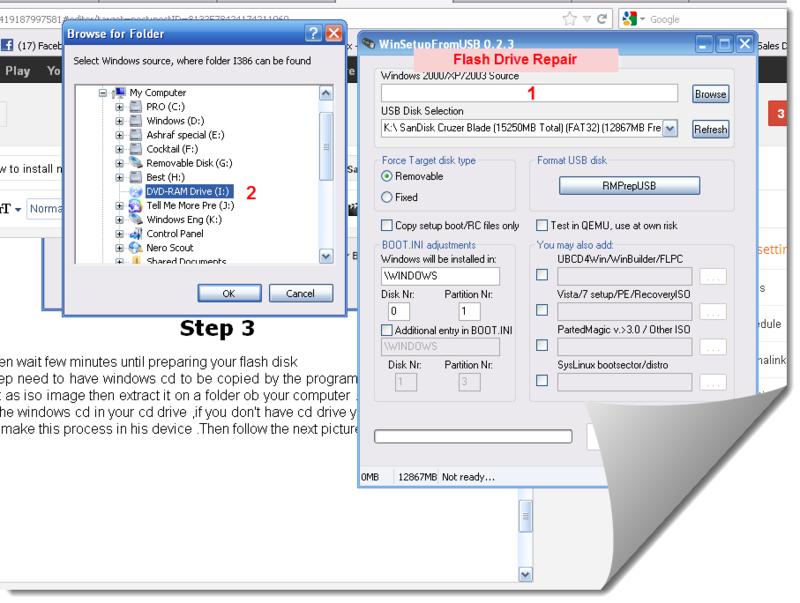 If you want to install windows just plug in your bootable flash disk in your laptop or computer and press F2 when turning your laptop then from boot options choose the flash to be the first boot then press F10 to save or another way you can press F12 or F10 depend on your laptop brand then you will see the boot menu you can choose flash disk from it then press enter . We will not make alot of changes only one thing , mark on Vista/setup/Pe/recovery iso then press browse then choose the windows 7 cd from your cd drive then press go .You must wait at least 10 min to complete your process .After complete installing you will see message press ok .Now congratulation my dear friend you have multi-boot Windows USB flash drive . Please if you like this article , share it with your friends to know this way .